Inventory We are a resale marketplace, not a box office or venue. Ticket prices may exceed face value. This site is not owned by The Tabernacle . The Tabernacle opened over 100 years ago in 1911 as a Baptist Church. In the mid 1990s it was sold to developers to be a new entertainment venue in time for the Summer Olympics. 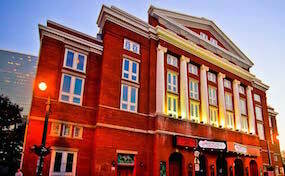 The Tabernacle box office is located at 152 Luckie Street in downtown Atlanta, Georgia. The indoor concert hall currently has a seating capacity of 2,600. Tabernacle tickets have brought in performers like Bob Dylan, Prince, Adele, and Guns N\? Roses, along with comedians like Dave Chappelle and Bob Saget. TheTabernacle.Theatre-Atlanta.com is not currently affiliated with any official venue, website, and or box office. We are an independently owned and operated company that concentrates in the online retail of all events in the secondary ticket market. Prices on our sites may be well below or above face value and will change quickly with market conditions. To order tickets to all Tabernacle Atlanta events please follow the steps online through the checkout.